Happy Deepavali to all Members..! As per available information from various exchange circulars, Muhurat Trading is scheduled as given below. Traders are requested to confirm the time schedule with the circulars available at respective exchange websites. Wishing a Very Happy Deepavali 2014 to all Members! Exchanges are conducting Muhurat Trading Session on account of Deepavali on 23rd October 2014. 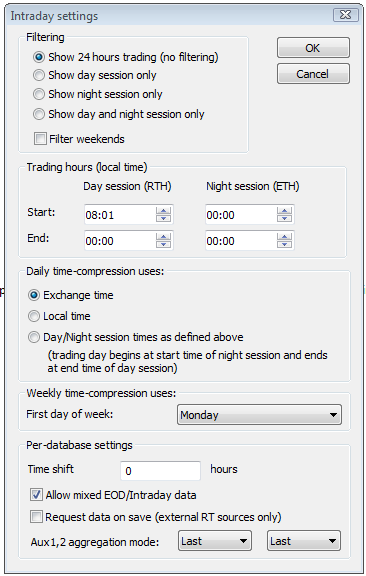 File > Database Settings > Intraday Settings > Filtering > Show 24 Hours Trading (no filtering) is to be selected in Amibroker. This setting will enable Amibroker to display charts with all data in database, irrespective of any start or end time settings given in Trading Hours box. Exchanges are conducting Muhurat Trading Session in various segments on account of Deepavali from 6:30 pm to 7:30 pm on 30th October 2016. Exchanges are conducting Muhurat Trading Session in various segments on account of Deepavali from 6:30 pm to 7:30 pm on 19th October 2017.